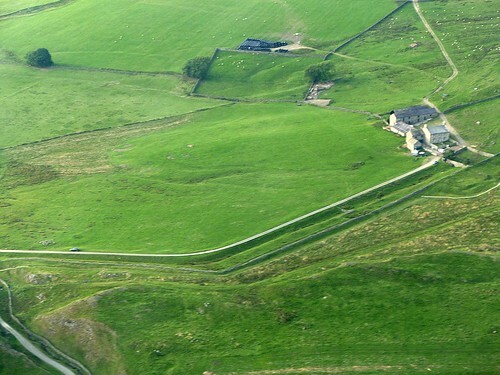 To the south of us, now, between the wall and the Military Road, are the remains of the Milking Gap settlement, a nucleated cluster of hut circles and enclosures that may have housed an extended pre-Hadrianic family of farmers (pottery from the site dated to the late 1st and early 2nd centuries AD). Although nothing is visible except from the air, it serves as a reminder that the Roman army were not the only inhabitants around here and how the Wall changed the use of the landscape once and for all and still has an effect today. 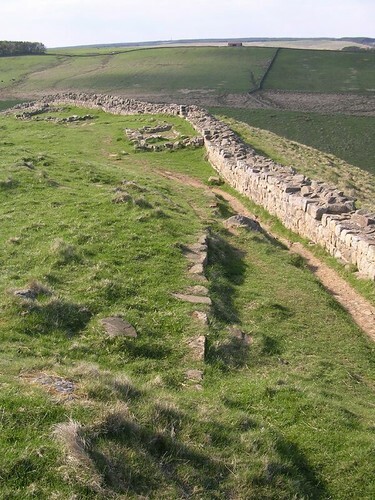 The modern stone wall is on top of the remains of the Roman wall immediately to the north of us. The course of the wall swings abruptly onto a more easterly course and we arrive at a kissing gate. Crossing the road leading to Hot Bank farm, we switch to the north of the wall and approach the plantation that clings to the slopes south of Crag Lough (pronounced ‘luff’). Just as the gaps and nicks through the Whin Sill were formed by glacial meltwater breaching the dolerite ridge, so the three prominent lakes north of the Wall (Crag, Broomlee, and Greenlee Loughs) are basins formed by the remnants of that same trapped meltwater. 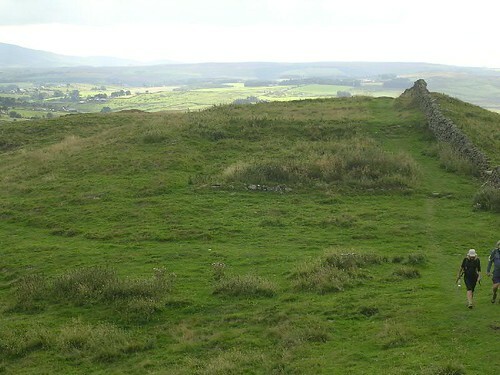 To our right, the ditch, inserted across Milking Gap between Milecastle 38 to Turret 38a to counter the absence of the defensive value of the crags along here, terminates. The gap was too broad to need a re-entrant. Sufferers of vertigo would now be well advised to detour slightly south onto the Military Way, also a right of way and still clearly visible for the most part as that grassy strip. To our right we can see Crag Lough (pronounced ‘luff’) and, as we enter a plantation, the path (and the wall immediately south of us) begin to ascend back onto Highshield Crags. Take the time to study the stones used in the field boundary to your left, since these are of course Roman stones reused. By now you are familiar with the size and shape of the regular facing blocks, but you may also be able to recognise narrower string course blocks, incorporated by the more recent drystone wallers. 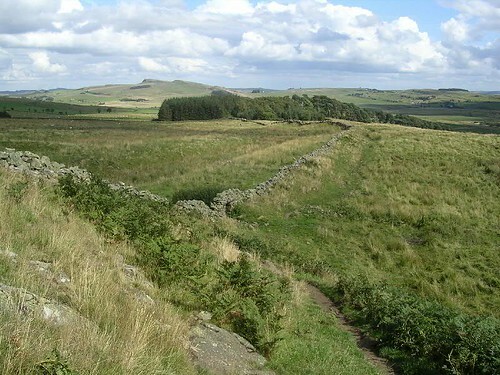 Along the central sector, the National Park maintains an impressive programme of recording and restoring these original stone dykes. Once at the top, we leave the plantation and a series of impressive clefts shows how precipitous this part of the crags is. As the consolidated curtain wall returns, we start to descend the winding stairs, pausing only to admire the north face of that consolidated curtain wall as we go. We have entered the iconic Sycamore Gap. Unusually, the curtain wall incorporates some blocks of dolerite in the facing of the footings. Notice how some of the curtain is carefully levelled whilst other portions follow the slope. 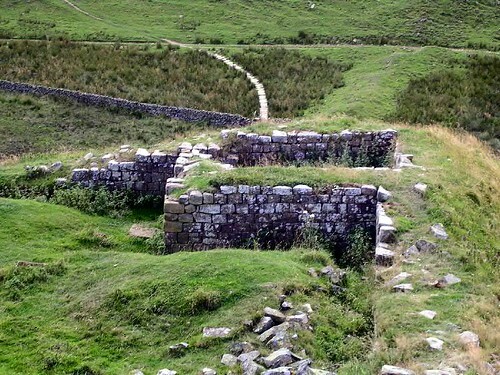 At the bottom, the path turns to cross the wall. Here we are able to see the dark and now shiny dolerite blocks incorporated in the core of the structure as we transit the monument. The eponymous tree is rooted amongst the fabric of the collapsed curtain wall. Its future has been ensured by planting a replacement slightly to the south within a circular drystone enclosure (called a stell; this is where it was originally situated when Jessie Mothersole walked past in 1921, so the new one is third generation; there was no tree here in 1907, when Maria Hoyer visited). This is the ultimate insurance against the day the main tree gives up the arboreal ghost and relieves the curtain wall of its burden. It is sometimes known as ‘the Robin Hood tree’, not through any folkloric association with that legendary character, but rather because it featured in the 1991 film Robin Hood: Prince of Thieves during a journey supposedly undertaken by the eponymous hero from Dover to Nottingham! We now have to climb the steps of the small hill known as Mons Fabricius, a name it gained in honour of the German scholar Ernst Fabricius, who visited the frontier in 1928 whilst in Britain to receive an honorary doctorate from the University of Durham. A leading light in the study of the Roman frontiers in Germany (the Upper German and Raetian frontier or Obergermanische-Raetische Limes), his is the singular honour of being the only scholar with a piece of the Wall landscape named after him. On top of the hill, the curtain wall abruptly turns onto a more northerly course to follow the edge of the crags. Amongst the grass on the peak, to the left of the path and at about waist height, there is a row of stones that are in fact the broad gauge foundation, set slightly back from the built line of the Wall. Yet again, we see evidence of pragmatic adaptation during construction of the frontier. Moving a bit further on, tucked up against the south face of the curtain wall to our right, there are some medieval shielings, or shepherd’s shelters. Now, ahead of us, we are treated to the spectacle of Castle Nick and its milecastle. The remains of the milecastle originally gave their name to the gap, which has in turn given them back to the milecastle (once scholars got around to numbering and naming them); I hope that’s clear. 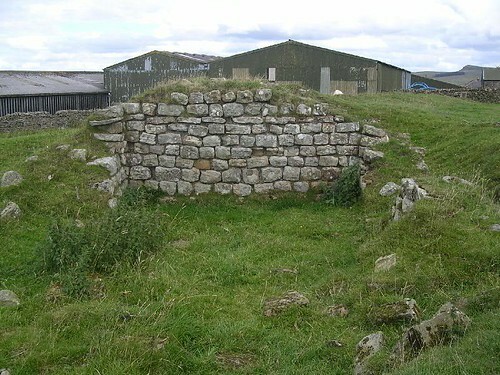 The surrounding walls of this long-axis milecastle are Claytonized and it has been the object of the attentions of excavators in 1854, between 1908 and 1911, and most recently in the 1980s. 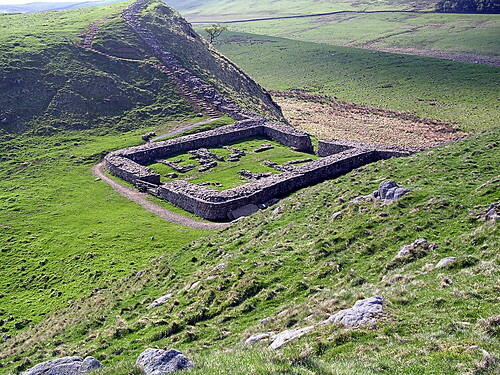 The structures visible inside it are for the most part post-medieval (it is said to have been used as a milking parlour) and demonstrate again the re-use of milecastles for agricultural purposes in later years, a theme to which we shall return. It was not located in its measured position but further east, perhaps deliberately to place it in the gap. We now leave Housesteads Crags and descend into a gap (complete with a short length of ditch) before ascending another height, known as Cuddy’s (after St Cuthbert) Crags. Wherever we see the Clayton Wall, keep one eye open for those slight changes in width on the south face. 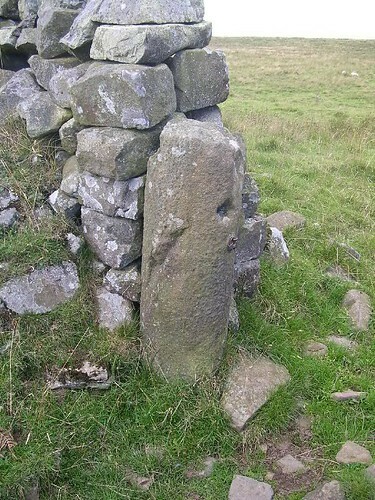 As we saw in Wall Mile 35, these expansions are a genuine Roman phenomenon, possibly marking the meeting points of curtain wall construction gangs. Those shy of scrambling can take the Military Way, which keeps to the south of the crags and is clearly visible as a broad grassy strip. These gaps, which will become a familiar feature for the next few miles, are glacial spillways, where meltwater from the last ice age poured through the Whin Sill, and they have the local name of ‘nick’ as we shall soon see. 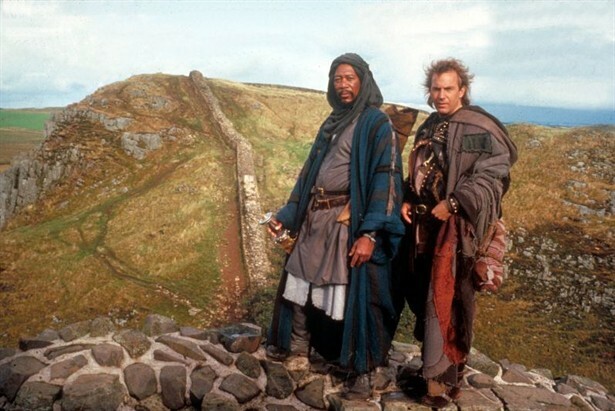 When the Wall builders encountered them, they used a standard defensive trick: the re-entrant. Instead of going straight across the gap, the wall was recessed to the south slightly. This had the advantage of making it both easier to build (the slopes were less precipitous) and defensively stronger (any attacker was vulnerable on the front and both flanks, rather than just the front). For good measure, the ditch (normally absent along the crags) was reinstated. 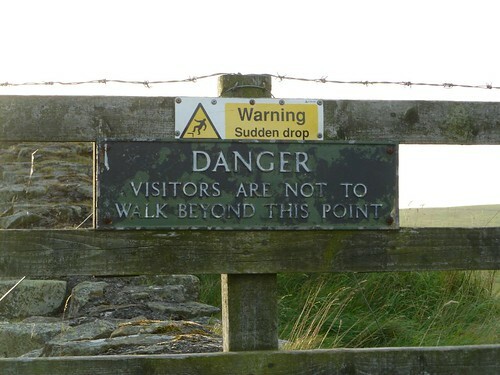 Who said Hadrian’s Wall wasn’t defensive? Once we reach the top of Cuddy’s Crags, we can pause to catch our breath and seize the opportunity to look back the way we have come. 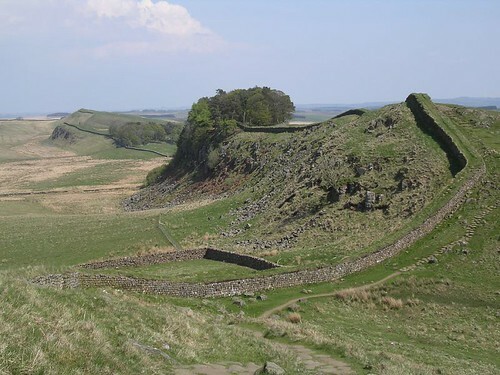 This is the most famous prospect of Hadrian’s Wall: the gap between Cuddy’s Crags and Housesteads Crags with Housesteads Plantation perched on the edge of the precipice. It is highly unlikely that you have never seen this view somewhere, whether it be on a poster, postcard, or book cover. One of the earliest versions was a postcard produced at the beginning of the 20th century by J. P. Gibson, Hexham pharmacist and internationally renowned photographer, and himself no mean excavator of the Wall. Having duly recorded the view for posterity in an appropriate fashion (camera, watercolours, charcoal, Etch A Sketch…), we press on. The going is easier for a while, with the Claytonized curtain wall to our right. Soon, however, it is abruptly terminated and we descend into Rapishaw Gap. Now there is a modern drystone wall on top of the curtain wall, pierced by a gateway that marks the arrival of the Pennine Way, which will accompany us for a while. The easiest way down the bluff with its terminated wall is to head south for a short way and then almost double back to get up to the line of the wall again, so that we are only descending easy slopes and not risking life and limb scrambling down rocks. We cross a stile and assail Hotbank Crags. 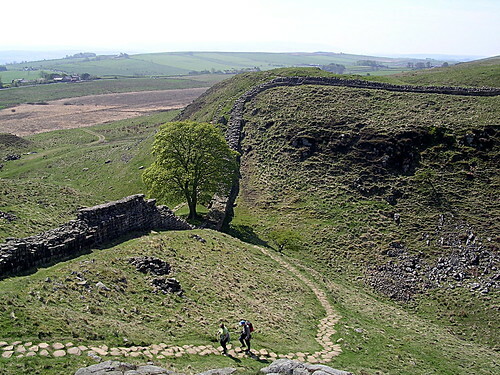 The ditch is rendered unnecessary again along the crags, whilst further down the dip slope the Vallum is gradually converging with the course of the curtain wall. 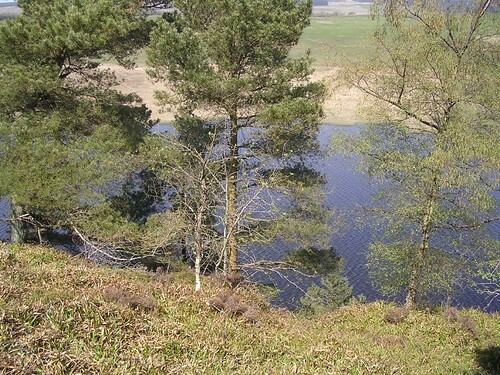 The dip slope reflects the angle at which the whin stone lies, sloping towards the south. The Whin Sill was in fact the first ‘sill’ defined in geology and is overlain by other rocks, including sandstone (which provides the building stone for the Wall) and limestone (which handily provided the mortar). These, because they lay above the whin, were present just a little way south, mostly near the Military Road. 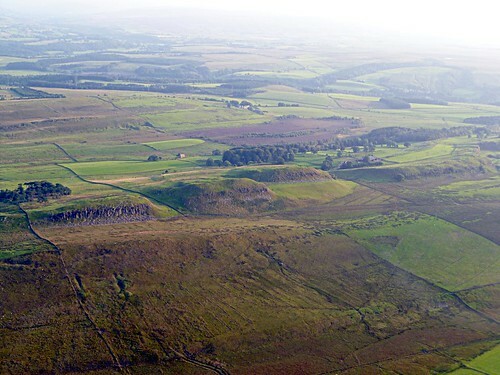 There was also some sandstone under the whin, hence there were also Roman quarries north of the Wall. Soon we spy a hexagonal plantation to our left and begin to descend into Milking Gap, a broad meltwater spillway. As we descend Hotbank Crags, it is abundantly clear that there are almost permanent problems with erosion up here so try not to tread on eroded areas (remember that grass is very resilient until it is worn down to its roots and then it becomes vulnerable). At the base of the slope, next to Hotbank Farm, we see Milecastle 38, with the path looping round it. This milecastle is a short-axis site with type I gateways, the northern of which was narrowed to pedestrian access only. The site is significant in many ways, both from a historical and conservational standpoint. 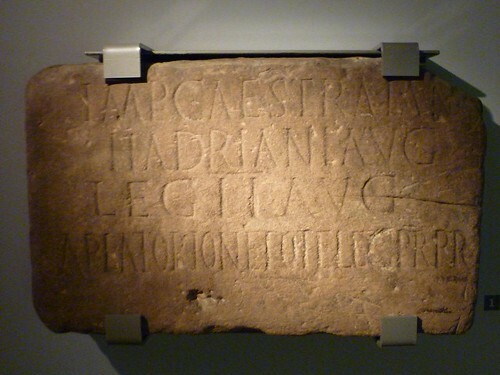 It is the origin of one (RIB 1638) and probably two (RIB 1637) of the building inscriptions that confirm that the builder was A. Platorius Nepos on behalf of Hadrian, thereby showing that Hadrian’s Wall really was… Hadrianic! We saw one of these when we visited the Great North Museum in Newcastle. It is worth pointing out now that, for those who want an easier life, suffer from vertigo, or just love Roman roads to the point where they are beyond all reason and help, the Military Way can be followed almost continuously eastwards from here to Housesteads and provides a useful (and less demanding) alternative footpath. It normally shows up as a grassy strip to the south of the curtain wall, usually closer when the going is easy, further away along the craggy bits, and it is clearly marked on the Ordnance Survey 1:25,000 Explorer maps (another good reason to have them with you). 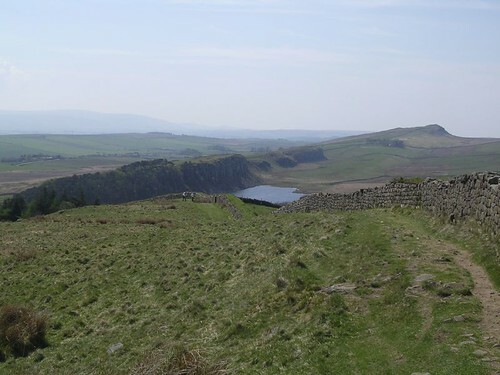 Heading east once more, and leaving Milecastle 42 in our wake, we climb gradually, with Claytonized curtain wall to our left, perched on the edge of Cawfields Crags. John Clayton, who owned this stretch of land during the 19th century, had his workmen consolidate the wall by excavating the tumbled facing stones that lay to either side of it and reconstructing them as coursed drystone walling on top of the surviving in-situ courses. This differed from the preferred Ministry of Works method of ‘as found’ consolidation in later years, but a compromise was reached whereby the newer was combined with the older to preserve the unusual character of the National Trust-owned stretches on top of the more accurate modern approach. Before long we pass the site of Turret 41b before encountering a small re-entrant at a slight nick, with a gate through the curtain wall. This is Thorny Doors. 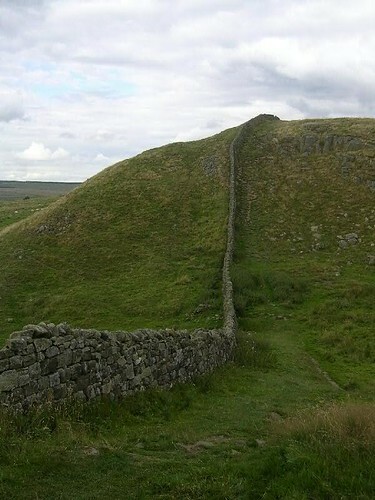 Immediately afterwards the wall makes an assault on a particularly steep section of the Whin Sill and it is here that the highest surviving piece of curtain wall (as opposed to reconstructed, like the facing at Hare Hill) is to be found. When consolidated, it is said that putlog holes for wooden scaffolding were found in the outer face of the wall and that it was eroded in an unusual manner, perhaps because of the way in which the wind is funnelled through the nick. We can only admire the horizontal coursing of the curtain wall as it seems to ascend the crags effortlessly. The next undulating stretch soon presents us with the remains of Turret 41a, demolished almost to ground level when the Wall was briefly abandoned when the Antonine Wall was built. The recess within the curtain wall was filled in and the turret never reconstructed. There is another slight turn to a more southerly course and we are soon approaching the site of the old Shield-on-the-Wall farm house, which sat directly on the curtain wall but was later moved slightly to the south (where it still stands, amongst a clump of trees). 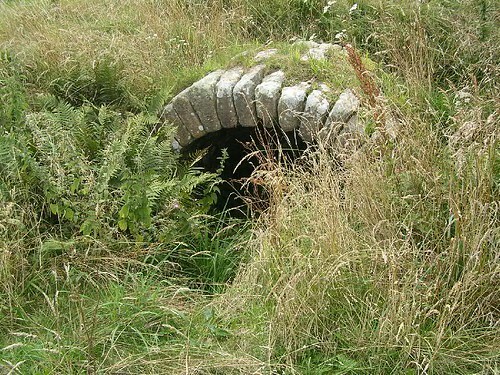 This is the shallow re-entrant at Caw Gap and a length of ditch duly appears to the north to cover it. A minor road passes through the gap and, after we cross it, we have a stiff climb ahead of us. The curtain wall to our left has now been replaced by a modern drystone wall on top of it. The climb is fairly relentless and continues all the way to Milecastle 41, but eases off in the latter part. 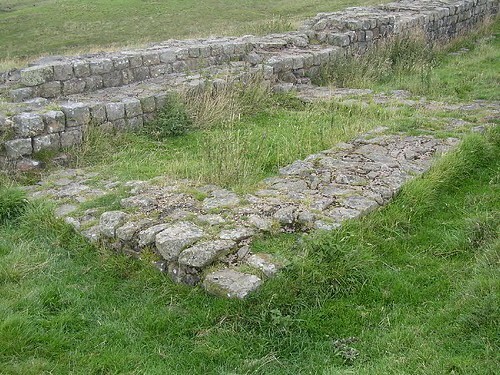 Milecastle 41 (Melkridge) is a short-axis milecastle that survives as humps and bumps. By now, you are probably counting off your walk in milecastles and beginning to feel a creeping indifference towards them. Be patient: there are still a few treats in store. 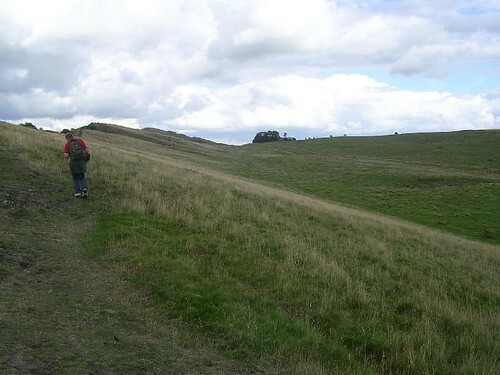 The Trail leaves the eastern site of the fort across a field with prominent remnants of post-medieval ridge-and-furrow ploughing. Once again, a modern field wall runs on top of the curtain wall to our left. Beyond it, the ditch keeps company with us as we cross a stile and enter the next field. When we reach a rather unusual wiggle in the modern wall, we are at the site of Turret 42b. Beyond us, immediately to the north-east, there is a large temporary camp, known as Burnhead camp (3.5ha or 8.6 acres if you prefer), probably dating to the construction of the Wall. 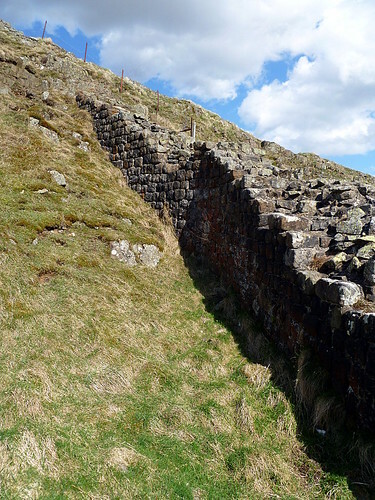 The Wall is now running downhill towards Cawfields Quarry, its distinctive triangular quarry face prominent at the western end of the next section of the Whin Sill crags. Passing Burnhead B & B we nip over a stile, turn right to go over the small bridge, then left at the junction to take us to Cawfields Quarry on our right, now a picnic spot which has the important bonus of public conveniences (as well as its very own webcam). The Trail next takes along the south side of the quarry, now filled with water, and we bear left to a kissing gate which actually takes us through the curtain wall once more. We can now take a brief diversion to the left to go up the steps to the point where the wall was unceremoniously chopped off by that quarry, whereby hangs a tale. Here, at this high point, let us consider a low point. When the central sector of the Wall was sold off in 1929, at the breakup of the Clayton estate, the National Trust bought part but did not realise at the time that they did not own the mineral rights. 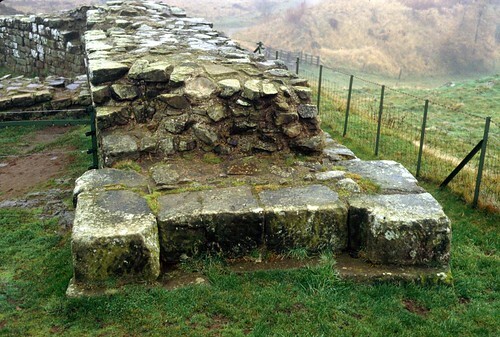 Those were leased off to one John Wake of Darlington, who planned to expand his quarry at Cawfields all the way along the southern part of the dip slope between the Vallum to within ten feet of the curtain wall. This, as all who remembered Turret 45b marooned at Walltown Quarry, would probably have been structurally disastrous, as well as totally ruining the setting. At the time, the Ancient Monuments legislation was not sufficiently beefy to protect the monument from this indirect, but nevertheless very real, threat. Celebrities of the day rallied around, including Rudyard Kipling and John Buchan, letters were written to The Times, and the government was forced to act, compensating Wake and limiting the spread of his quarry, so that it grew no more than what we saw as we walked past, finishing working in 1952. Ugly truths had had to be confronted, particularly those touching upon employment (at a time of depression) set against ‘heritage’ (as we now insipidly term it), as well as the duty of the state in preserving monuments for current and future generations to enjoy. Every time a mountebank pops up and says planning legislation is too complex and too biased towards ancient monuments, whip yourself with the stingyest of nettles to remind yourself of this salutary tale. 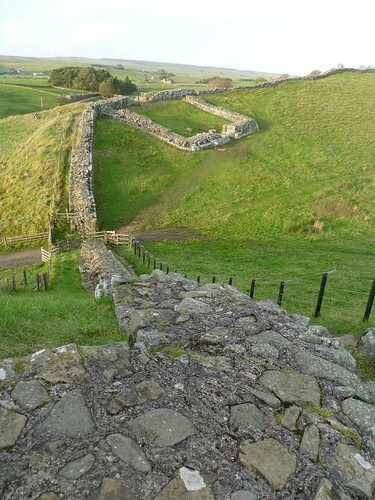 At the top of the steps, we can turn back and admire Milecastle 42, laid out before us in a way it is difficult to better once you are down next to it. 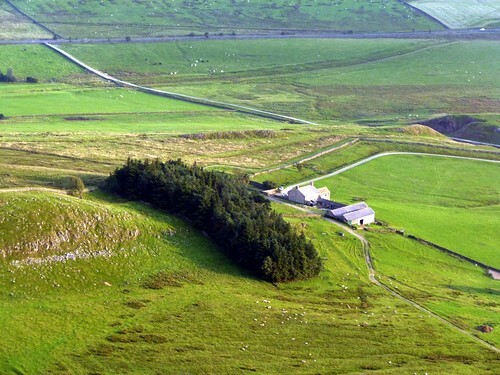 You may also glance to the south and see the confident earthwork of the Vallum striding across the countryside, dead straight, enjoying its freedom from the crags. Between them can be made out the grassy strip of the Military Way, dogging the footsteps of the curtain wall like a faithful servant. 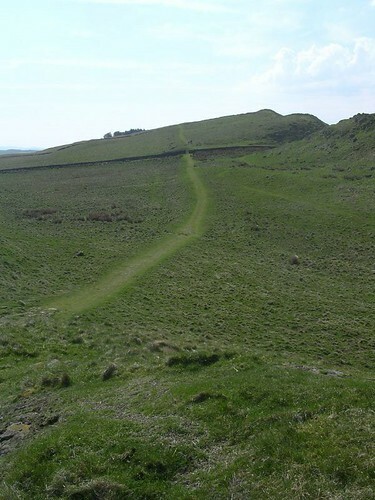 Back down the steps, we cross the last few metres (or, if you remain unmetricated, yards; you still have to walk the same distance) to reach Milecastle 42, which we have already admired from atop the truncated hillock. Milecastle 42 (Cawfields) was first excavated by John Clayton in 1848, re-excavated in 1935, and finally consolidated in the 1960s. 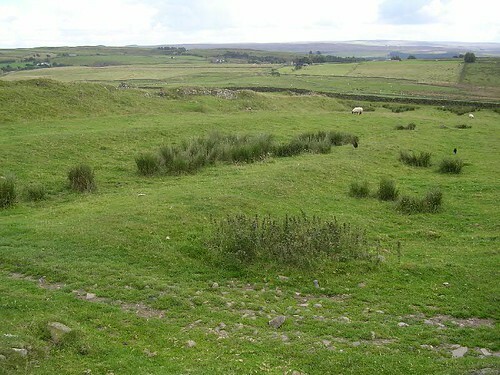 The outline of this somewhat drastically sloping short-axis milecastle is clear but no internal structures were identified (or survived). The gateways are rather noteworthy, the south for the height of its masonry, the north for its marking-out lines (used to align its now-missing masonry) and for the remaining sockets for its gates. A fragment of tombstone and a Hadrianic building inscription come from here. The curtain wall trundles along the top of the crags in a north-easterly direction for about 200m before making a turn to a more southerly course and descending into Walltown Nick. We cannot easily follow it directly down but need to take a more southerly course, before finding a stile across a stone wall and then a paved causeway across the boggy base of this nick. To our right is a low mound surmounted by trees, known as King Arthur’s Well; this is not the last time we shall encounter the Once and Future King on our journey. We are now confronted by a steep climb up some rudimentary stone steps (they are modern and some have been cut with an angle grinder to give added grip). Ultimately this takes us to Turret 44b on Mucklebank Crags, but before we examine it, we can now turn and survey the path we have just negotiated and observe the Wall from our eyrie. The line of the curtain wall, although ruinous, should be clear, slightly to the north of the paved path. North of that again is the line of the ditch. 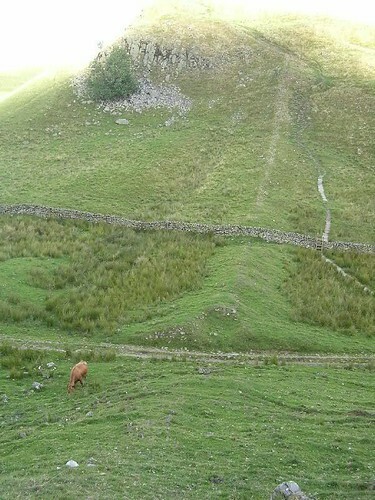 Although not needed for much of the Wall’s course along the crags, the ditch reappears whenever a nick or gap appears where its defensive provision is deemed necessary. 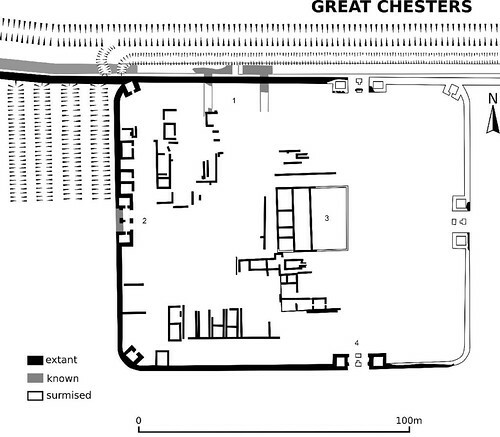 This, incidentally, hints once again at how important the ditch (rather than the curtain wall) may have been in deciding the course of the Wall and suggests that the latter was subservient to the former. After a brief exposure on either side of the turret, the curtain wall returns to being a low mound along the top of the crags for another 100m or so before descending into the next nick. Once again the curtain wall diverts south to embrace this and a short stretch of ditch appears to cover the break in the crags. It climbs again briefly and then repeats the performance with another diversion and accompanying stretch of ditch. This defensive trick is known as a re-entrant and allows a defender to dominate an attacker who might choose to assail a weak point (which has been helpfully reinforced with a length of ditch) from three sides. That is why the Wall does not run straight across. After the third of these nicks the terrain settles down a little bit, we cross a stile and note that there is now a drystone wall on top of the curtain wall to our left and that a gateway through the wall we have just crossed marks the line of the Military Way, the road that links all the turrets and milecastles. The astute will even be able to make out the course of the road, about 35m south of the curtain wall. We pass Alloa Lee Farm (which you’ll usually see referred to as Allolee) to our right before encountering the site of Milecastle 44 just before a turn in the Wall slightly south of east. By now you should be getting your eye in for the humps and bumps of unconsolidated milecastles. The long-axis Milecastle 44 (Allolee) is visible as an earthwork. It has evidently been excavated at some point but when, by whom, and what was found remain a mystery. This is why excavation is sometimes euphemistically referred to as ‘preservation by record’; without a record, there is no ‘preservation’.